London’s Metropolitan Police have now arrested two young men following a spate of acid attacks in London Thursday, which left victims with life changing injuries. While one of the teens, arrested on suspicion of grievous bodily harm and robbery has been released on bail, a second has been remanded in police custody. Details released in a police statement Saturday evening said the 16-year-old identified as ‘A’ had been charged with 15 offences in relation to the acid attacks in London. He will appear before Stratford Youth Court Tomorrow, Monday, 17 July to answer three counts of robbery; four counts of attempted robbery; one count of possession of an item to discharge a noxious substance; five counts of attempted GBH with intent; one count of GBH with intent and one count of handling stolen goods. No details about the identity or background of the suspects have been released at this stage. Police said their investigations into the attacks were still ongoing. Breitbart London reported Friday on the five attacks, which took place at a number of locations across North and East London on Thursday night. All happening over the course of just 84 minutes, the alleged attackers rode moped motorcycles up to other road users before spraying them in their faces with corrosive substances and then stealing their mopeds before riding on. One victim in his 20s was reported to have sustained “life changing injuries” after having acid squirted into his face on Thursday night. Among those attacked on Thursday night were Deliveroo and UberEats drivers, who have been the focus of reports on a “crimewave” targeting delivery drivers in recent weeks. The Hackney Gazette reports food delivery riders had been sharing concerns after a number of violent attacks by knife-weilding children and young adults as they targeted them for their bikes. Speaking to the newspaper, a delivery rider said of the attacks: “In the past month physical attacks with knives have started. 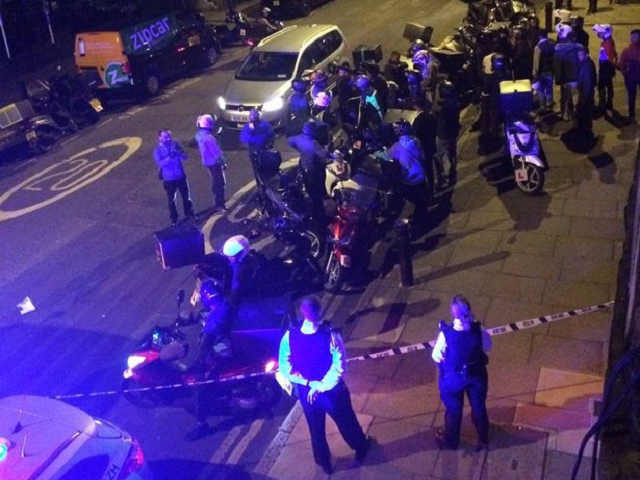 Drivers are being held at knifepoint, mostly in Shoreditch or Hackney Central.